Despite developing my taste for rum over the last few years, I only heard of Rumfest in 2012, then in its sixth year. Then, we tentatively shelled out our £20 for entry and five tasting tokens, wondering if it was even worth it. It totally was. Turns out 90% of the stalls didn’t operate in token currency and we got to sample some rare rums and be introduced to small brands who don’t get much exposure over here. Fast forward twelve months and we were really looking forward to Rumfest 2013. After umming and ahhing about whether we’d step up to the £45 tickets for Conoisseurs’ Cove – a new addition to the seventh year of festivities – we decided to stick with the basic £25 ticket, expecting a similar experience to 2012. However, what a disappointment! The ‘standard’ zone had around six stalls of highly commercialised brands, offering cocktails, not even tasting samples. Those who’d sucked up the 100% price increase were the ones with access to the real stuff. Fortunately, we got two of the last places on a Mount Gay masterclass which, although almost an hour late, was the only redeeming feature of the day. One of the company’s brand ambassadors (travelling the world, talking about and tasting rum…where do I apply?) took us through the rum-making process, passing around raw sugar cane, molasses and Mount Gay’s signature notes of banana, almonds, vanilla and coffee to warm us up for the tutored tasting. It’s a lot like wine tasting: hold it up to the light to see the colour, smell and an interesting one, swirl it around the glass and see if it’s a short or long ‘leg’ – how long it takes for the residue to fall back into the glass. A single-distilled rum will have short legs, i.e. drip back almost instantly. A rum which has been double-distilled will have a long leg and leave a mark. We now do this with all our rums at home! We got to try the entry-level Eclipse, the developed Extra Old and a treat, the 1703, Mount Gay’s most premium rum. It’s very clear to taste the difference between the spectrum of products and maybe that’s why Rumfest was so different this time – splitting those who don’t mind a Havana Club mojito from those who want to savour a St Nicholas Abbey. This isn’t how the event was advertised, however, and I don’t understand the rationale, especially from someone who’s given themselves the title ‘rum ambassador’. Sadly, I don’t think I’d attend next year if this model was retained. For the £90 entry we could buy many bottles and do our own rumfest at home. 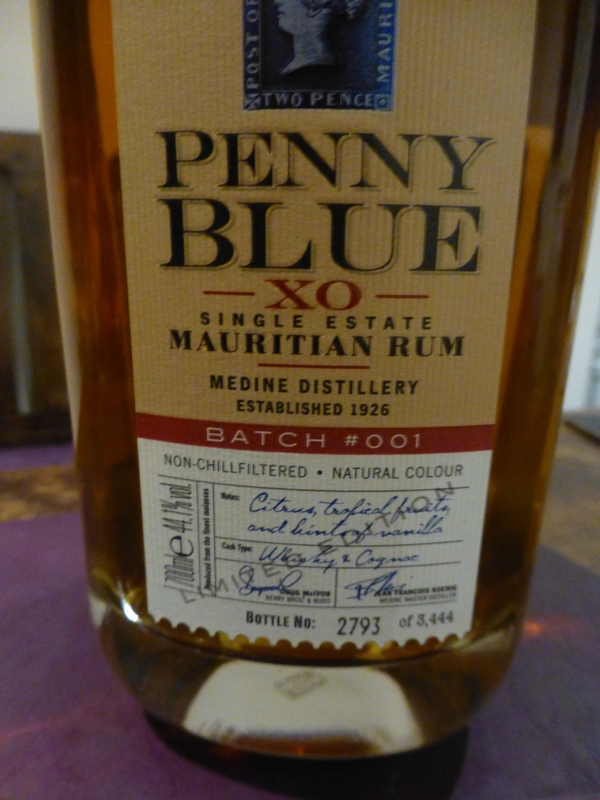 Heading that way, we were tempted by the newly-launched Penny Blue XO Mauritian rum, which I picked up from the Berry Bros & Rudd (BBR) store on St James’s Street. It’s primarily a wine merchant, with well-heeled clientele flickin through the vintage wine catalogue. In partnership with a local producer, BBR have developed an extra old agricole rum, which we just had to try. It was actually my favourite one so far. 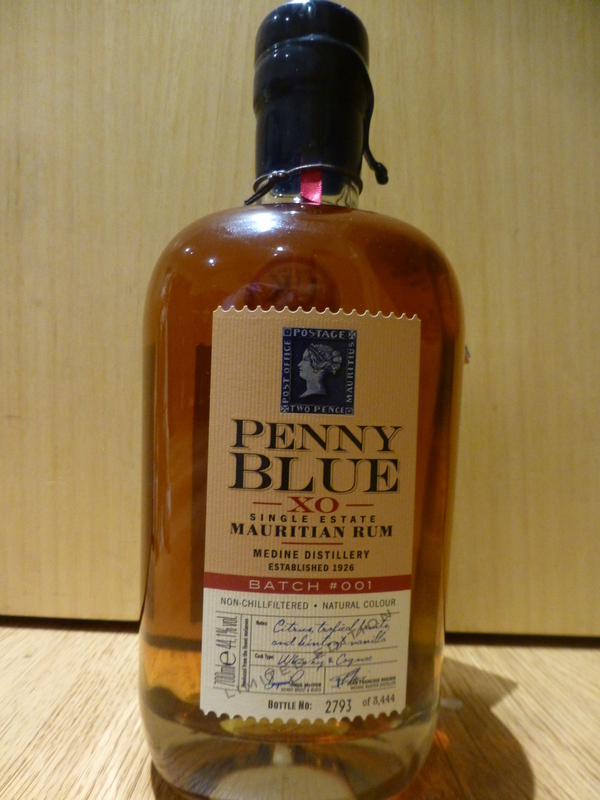 Slightly syrupy like the rhum arrangé I had in Mauritius and really nicely flavoured. 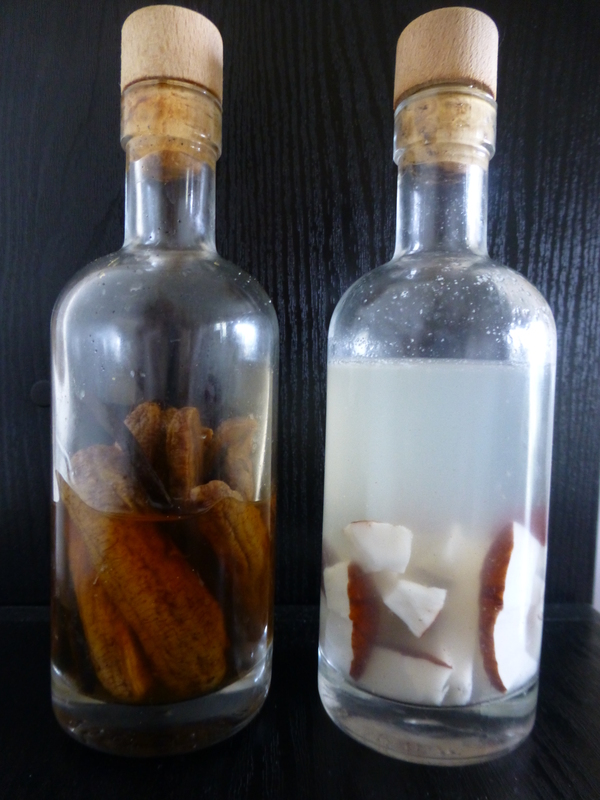 I kept in the vanilla pods from a previous rhum and I think there’s six dried bananas in there, plus a *touch* of sugar. On the right is my coconut one. With a glut of coconuts, and a sore arm from hammering, grating, peeling and chopping for other recipes, I shoved in a few handfuls of the flesh and the water from one coconut. I didn’t put sugar in this one which meant that on tasting, it still had the rum bite. The flavour was spot on, though. I’ve added a teaspoon of sugar to try and bring down the alcohol and think that may well be right behind the banana one in my favourites ranking.